Several years ago after moving into our suburban oasis, I read a book called A Slice of Organic Life. That book suggested that everyone could add a little bit of organic life into their own a tiny piece at a time. To that end, we purchased 6 New Hampshire Red laying hens, and my husband built a small coop to house them. I was fascinated by these creatures and would spend an inordinate amount of time just watching them wander around the yard. When a neighbor said she was getting out of chicken keeping and asked if we wanted her birds, I jumped at the chance to own a few more. Integrating the 2 flocks did prove to be problematic, but eventually they worked out their pecking order and settled down into their newly combined family. Ordering chickens turned out to be a bit surprising. 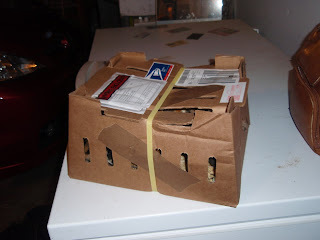 I had no idea that chicks were shipped through the regular mail. In the first couple of days of life a chick doesn’t need food or water to survive. Just before hatching the chick eats its yolk sack, and this sustains it for about 48 hours. In that narrow window, the chick can be mailed in a cardboard box alongside a few dozen of its siblings. Warmth is the most important factor for chick survival at that time, but the extra warmth of nearby bodies is enough to keep everyone alive for the short journey. Every time you order chicks, the company asks if you would like a free exotic chick added to the order. This is code for ‘do you want us to throw in a rooster or two’. Each time I’ve said yes thinking that something free is always nice. But now that we have at least 4 roosters eating feed and strutting around our hen house, I’m not sure if free is always good. 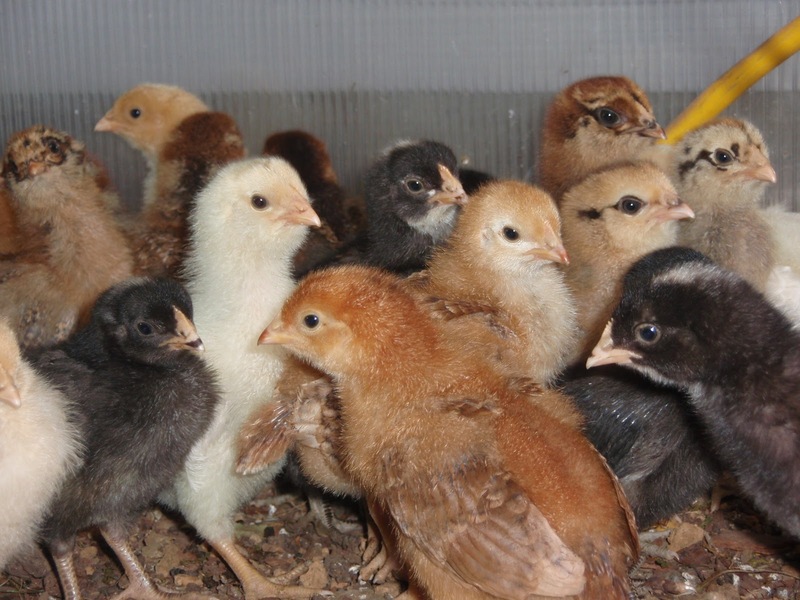 (The gender of some of our chicks is still unclear. So we could have more than 4.) The roosters do add an interesting dynamic to the flock, though. Adding that male element to the coop makes all interactions more exaggerated. The flock now has a clearly defined hierarchy and a literal pecking order. The lack of feathers on some of the hens’ backs is a reminder that those on the lower rungs of the pecking order do get pecked. The roosters are obviously in charge and walk around with a strut that lets everyone know they are the boss. When they find something interesting to eat they make a sound to call the hens over to investigate. And interestingly, the roosters don’t eat first when they find food; they wait for the hens to eat. I speculate that the roosters subscribe to the theory of ‘Happy wife, happy life’. Before we had roosters the hens had a very similar hierarchy amongst themselves. The main difference between the then dominant hen and the now dominant rooster is that the hen didn’t notify the other hens when she found food, but instead ate it all herself before others noticed. I guess she didn’t care what the others thought of her as long as they knew she was in charge. Since that time we’ve raised 3 flocks of chicks to adulthood in our greenhouse and successfully integrated them into the main flock. After that first integration experience, I learned that to reduce the fighting that can occur when new birds are introduced to the flock you should introduce the new birds at night. Just sit the new birds on the roosts next to the main flock while they are sleeping. In the morning the old birds and the new birds seem to think that everyone has been there all the time. I guess the fact that chickens have brains the size of walnuts comes in handy once in a while. 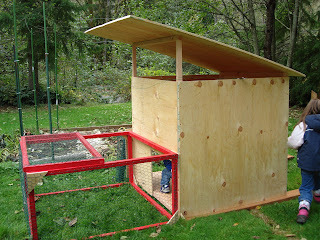 After a while we realized that the first small coop just wasn’t large enough to house our growing flock. Having too many chickens in too small of a space results in pecking and fighting during the nightly race to see who gets the good spots on the roosts. My husband added more roosts to the coop, but even with that added space, it was clear that the coop just wasn’t large enough to accommodate the size flock we seemed to be building. That’s the thing we learned early on about chicken keeping…it’s addictive. Once you have a few chickens you want more and more and more until your friends and neighbors think you’re that crazy chicken lady. So, I did some research on chicken dwellings and came to the conclusion that a simple metal shed building from the hardware store could be altered fairly easily to meet our needs. 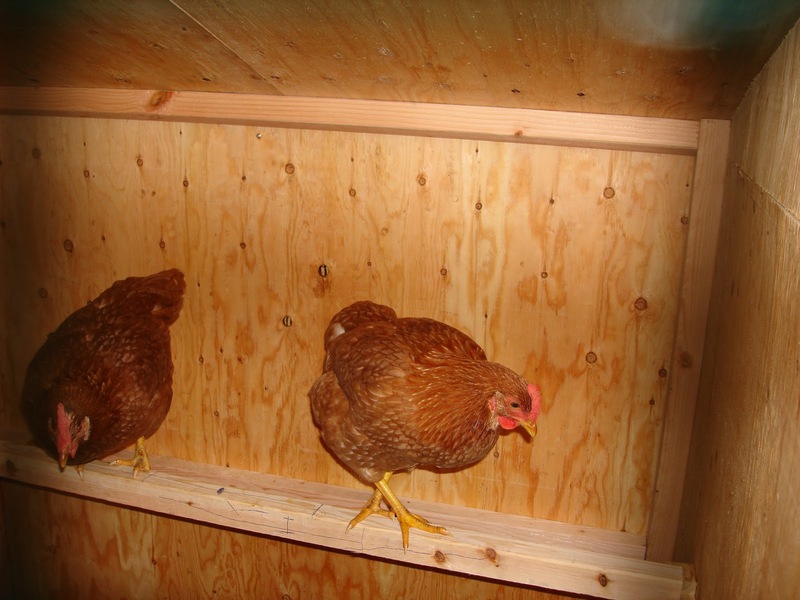 It was economical compared to buying or building a wooden coop and it was likely to last longer as well. After cutting a few holes in the back of the shed to allow the chickens to exit into the fenced chicken yard, cutting and screening ventilation holes, making raised platforms for the nesting boxes and adding some ladder-type roosts that leaned against the wall, the coop was ready to go. The feeders hang from chains attached to the ceiling, and the waterers sit on pier blocks in the middle of the coop. So far this setup seems to be working pretty well. The only issue we’ve had with our metal coop is the sliding door that came with it. Manure buildup keeps getting into the rails on the bottom of the door making it hard to open. 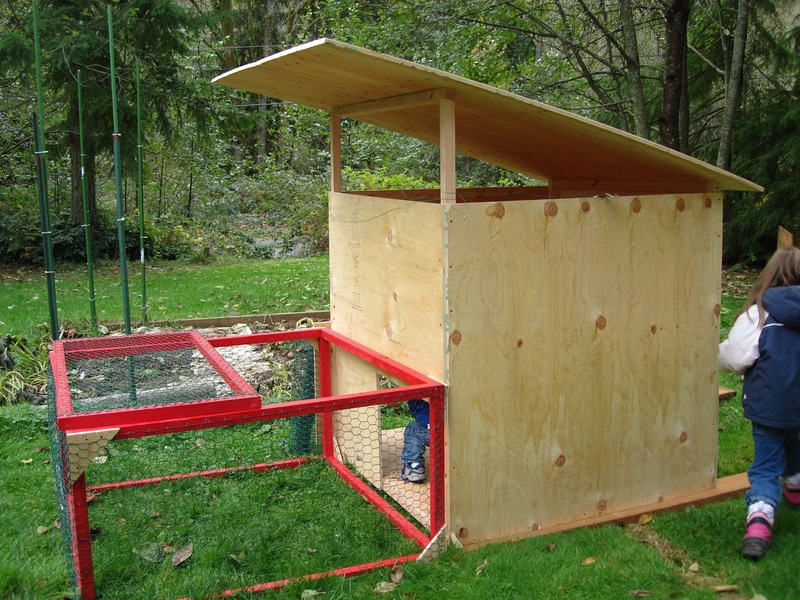 So if you’re considering using a prefab building for a chicken coop, get one with a swinging door rather than a sliding one. Keeping chickens has had many benefits for our ‘farm’. Other than the obvious benefits of pure entertainment and having fresh, healthy and nutritious eggs anytime we like, our garden has seen many advantages to having the chickens nearby. Living in the Northwest, slugs are a constant issue, but since chickens started roaming our yard, our slug population has seen a dramatic decrease. Additionally, our compost is much richer now that the manure from the chicken coop gets added to it regularly. This year, I planted Pumpkins and zucchini directly into a pile of compost and despite the awful weather we had last summer, those plants continued to produce throughout the summer and into fall. I recently read about using chickens to weed the garden in the spring rather than doing it by hand or tilling. Since I hate pre-season weeding and don’t like to cut up my worms with a tiller, I thought I’d give this method a try. The first few week of having chickens in the garden was miraculous. The garden went from completely weed covered to almost bear ground in no time. The chickens also managed to dig up a potato I’d missed in the fall, but my husband snatched it before the chickens realized it was something they could eat. One thing I forgot to do was to remove the landscape fabric that lined the walkways of the garden before letting the chickens have free reign. They’ve managed to scratch most of it into tiny pieces. But I suppose with all of the time I’ve saved by not having to weed the garden I’ll have plenty of time to lay down more landscape fabric. When we got our first chickens we really started to notice just how many sayings in everyday life come from chickens. “Pecking order”, “cooped up”, “flew the coop”, “ruffled feathers”, “mad as a wet hen”, “coming home to roost”, “feather your nest”, “nesting instinct”, “protective as a mother hen”. Can you think of more? so... say i was going to have some chickens... how many would i want? we are not HUGE egg eaters.. but use them for baking and we do have breakfast for dinner once a week... i guess we're pretty inconsistent w/ our usage. sometimes a dozen will last us a few days, other times a few weeks. You need at least 3 for warmth through the colder temps, but I think 5 or 6 is a good number for a family of 4 or 5. They start laying when they are about 5 months old and depending on breed will lay about an egg per day until they are about 18 months old. Then they start laying less and will take a break for a couple of months in the winter to molt. That's the point when you can replace them if you want consistent production.